We packed up our two qualified horses, Post Exchange and Stirinupastorm, ourselves, and a weekend's worth of junk. Left at 4 am on Thursday, made numerous pit stops to water, hay and feed ourselves (even unloaded our horses at a state park in West Virginia), and arrived at the Fairgrounds at 5 pm - WHEW!! Kim and Cassie took the horses for a walkabout while Peggy unloaded junk and set up the stalls in the tents that were MUCH closer to Freedom Hall than in '98 - (It was just too bad we showed in Broadbent, or it woulda been DAMNED convenient.) Kim's folks arrived Friday morning after we fed and walked the horses again. We had time to walk around the vendors and gasp at some of the set-ups at the big training barns - they were nicer than my HOUSE!! We got the horses out a few more times that day to stretch their legs and see the arena they'd be showing in. Our alien friends, Al and Sandra (aka SOOKY) showed up at the ungodly hour of 11:50 PM. After an absolutely hilarious fiasco to gain access to their hotel room (talk SLOWLY, they don't speak American, they're CANADIANS!) we got all of 6 hours sleep before rising to feed the horses again. We were able to watch some trail classes (like dressage over poles) and some halter classes before meeting up with Peggy's sister, Betsy and her son Campbell, who drove up from Nashville in record time...then picked up Jeff and our coach Katie Rose from the airport, all the while being regaled with tales about their flight! (the toothless guy next to them was from Baltimore, NOT Kentucky!) We all finally hooked back up for lunch, including the wandering aliens ("It can't be THAT hard to find their stalls, Al! ), pony, golf cart and Jeffrey rides for Campbell and a nice schooling session before we headed back to our hotel rooms for pizza, margaritas, pina coladas, Canadian Club (from CANADA), and tack cleaning, PLUS lots of laughs and photo taking. Four a.m. came early (ugh!) as we were slated to have Warm-Up at 6 and we were 4th and 5th in the posted order. When we got to Broadbent at a little before 6, they were still setting up the jumps.....it was COOOOLD and windy! Kim and Cassie warmed up umpteen times before they actually got to go (they changed to a numerical order suddenly and we were in the 1400's!!) but both had good warm-ups and felt ready. The course was very simple and straightforward. The Purebred Open went first, with Kim laying down a good course on Lady and getting a call back in the top ten scorers!! Her second course also won her a call back ribbon, so we were pretty confident she'd be in the Final Top Ten. 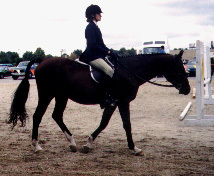 But, we had to wait for the Partbred Open classes with Cassie and PX. Cassie was riding against 22 professionals, she being the only one even under 18, let alone 13 years old! Her two courses were great, with only one or two sticky fences, which was enough in this tough competition to keep her out of the ribbons. Peggy was so proud of her composure and maturity at handling this so well....she was understandably disappointed, but was a real trooper. 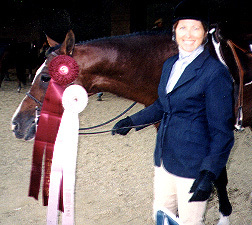 Kim rode in the Under Saddle (Final) phase, and we waited to hear her number called back and there it was!!! She had won a TOP TEN!!! 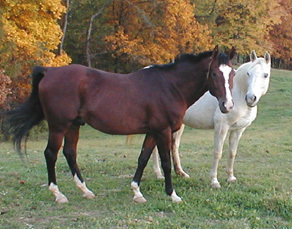 They looked awesome trotting in and posing for their photos. 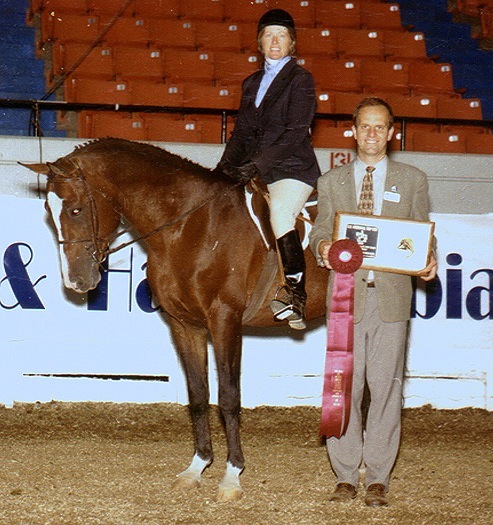 Kim then had to ride in the Adult Amateur Owner division. She was called back in both, but only got a ribbon in the first class. We knew she'd have to hack really well to win another Top Ten! Finally, it was Peggy's turn. We'd been at the ring for 10 hours by the time she went in the Amateur Owner on PX. Her first course was great! Everyone was excited when she got a call back ribbon in that. Then we had to wait thru all of the others as she had gone first in the first class and was last in the second! Her second course was done half asleep, according to her, and didn't get her a call back. 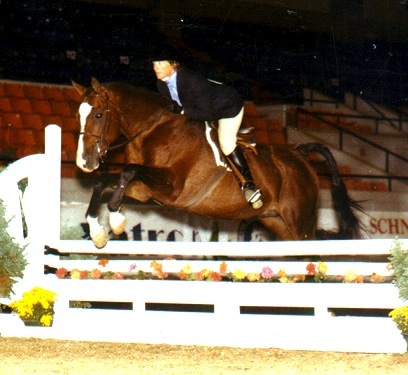 Kim went in for her hack class and did it again....she pulled off another TOP TEN!!! We were thrilled that all the hard work had paid off! Morning came WAYYYY too early, we got them to the plane in the nick of time, fed the horses, packed up the rest of our junk, loaded them up (Lady was like NOOOOOO not the TRAILER!!!). We stopped at the show office to check the cards, then hit the road at 8 am. We tried to drive straight thru, but mother nature demanded regular stops...we got home around 8:30 that night. The next day, PX was turned out with his "girls" for the winter, much to his delight! All in all, it was a great trip. We did more than we could hope for and got there and back safely. We were already planning for 2002 with PX and Lady's now 3-yr old daughter, Post Meridian competing too! Hey, I wonder, how long is the drive to Albuquerque?!?!? !